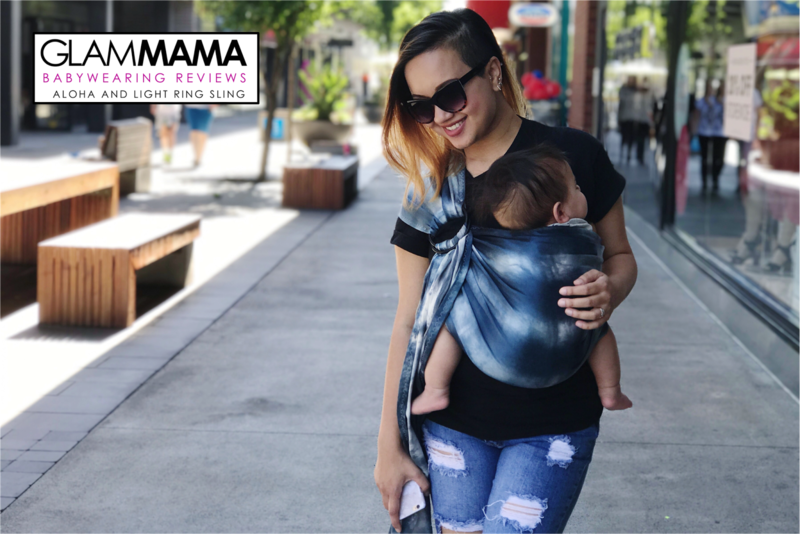 I first discovered Aloha and Light in 2011, at a time when my babywearing days with the older boys were winding down and I didn't have a good reason to buy a ring sling. I remember following them on Instagram and coveting every ring sling they came out with. Now, after so many years lusting over them, I finally have an Aloha and Light ring sling! There are quite a few different colors, and I had a bit of trouble deciding on which one I wanted to order. In the end, I decided on Moon Meditation because it looked monochrome, haha. I am so predictable. Anyway, the slings arrived at my door step way quicker than I thought they would! It made its way from Hawaii to Australia in just 10 days, much to my delight. When I finally unpacked the slings, I was a little surprised to find that it is actually shades of blue...my least favorite color! But rather than being dismayed, I actually liked how the blue and white combined on the shiny hemp silk fabric to give it a luxe denim look. The sheen is incredible but it worried me a little because I was concerned that it would be too slippery and that I would have to keep readjusting the sling the entire time I'm wearing it. Thankfully, that's not the case at all! The sling stays put even better than the other ring slings I have (one's Egyptian cotton, the other is cotton-linen). See, the "wrong" side of the sling is actually super grippy, which means the tail locks in whenever you adjust it. I, for one, hate having to constantly fiddle with my slings when I wear them. So this is a big plus in my book! Another big plus? The fact that this sling is SOOOOO supportive! I'm not one to use ring slings for long lengths of time, so the main reason I have ring slings is for quick ups and downs, where I know I'm taking Adam in and out of the sling constantly through the day. But in the times where I've had to unexpectedly wear Adam for longer periods than I planned, this sling has been a savior. The shoulder style is a unique, patent-pending style that is compact but can be spread out if you need the extra support. I actually really love the style, it's a perfect fit for my narrow, sloping shoulders and it isn't as overwhelming as, say, a gathered shoulder style. If you're interested in Aloha and Light ring slings, do follow them on Instagram and head to their WEBSITE to take a look at their collection! CLICK HERE to see more babywearing reviews!